Uncle Bob, not a scientist, did come out from time to time to see how I was doing and to make sure I hadn’t passed out in the garden. He’d make small talk. At one point he asked me what other things I was planting. I’m glad he didn’t ask about peppers. I have started peppers from seed for the last three years and they’ve always done well. I started some this year, too. I soaked the peat pellet disks and placed them on the heat mat in a dark place. Pepper seeds germinate best in a warm and dark place. 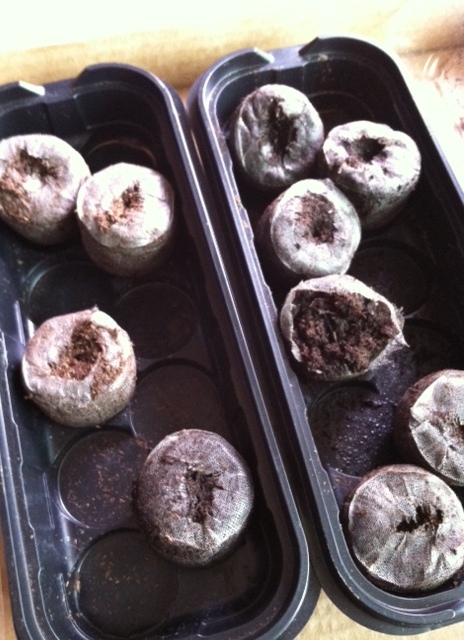 After five or six days, I started checking them, looking for sprouts. I kept checking for another week and still no peppers had sprouted. I took one of the pellets and gently examined it. I removed the netting on top of the pellet and pushed the peat around with a toothpick. Was the seed rotting? Then it dawned on me that I had forgotten something important. I had neglected to put any seeds in the pellets. Nothing was germinating. Zero times zero equals zero. Wait! Would it be so bad to be a Pretender? Maybe I’m not the Julia Child of gardening. Maybe I’m the Chrissie Hynde of gardening. Some of us are looking at the stars. This entry was posted in Back to School, Experiments and Challenges and tagged Chrissie Hynde, forgive me when I fail, it's always the 80's, Message of Love, peppers, Pretenders, tomatoes. Bookmark the permalink. Could be worse. Your cat could be using your watermelon mounds as her litter box. Julie things happen. You will look back at this and laugh about it. Just think if we could not look back at things and laugh. That is what makes life fun. I know you enjoy starting your own plants but don’t forget when you do buy plants you still have to take care of them to get the produce from them. You will still enjoy your garden and you know what you will not forget to plant those seeds next time. I haven’t even gotten my garden in yet hopefully this weekend. Enjoy your week. Aw, thanks Pauline! I’m glad Uncle Bob doesn’t like peppers! I am still impressed. The only problem is that your photo looks like chocolate donuts and now I am craving some! Elizabeth, you crack me up! I was going to call this post “These are not donuts,” and I changed my mind at the last minute! Thanks for stopping by and I hope to see you soon!